There are too many tough challenges today’s online marketers have to face on a daily base. One of these challenges would be the limited time and resources they possess to reach their ultimate goal of driving the business to success and achieve high returns on investments. Long past are those days when nine out of ten marketers were focusing their efforts on achieving most of their traffic from major search engines’ organic listings. At that time, it was quite sufficient and effective at the same time to drive a constant flow of highly qualified leads to their websites. Just like the evolution of internet, online marketing had its own fast paced evolution, thanks mainly to the variety of new marketing channels or touchpoints and devices today’s customers are using. In my post, I want to emphasise the top 10 reasons why both small (startups) as well as medium and large-sized businesses might or better should be considering sooner or later the implementation of a marketing automation software within their organisation. If interest over time and especially on a global scale shows an increasing tendency, that must be more than a strong evidence of its credibility that marketing automation is in its heyday. 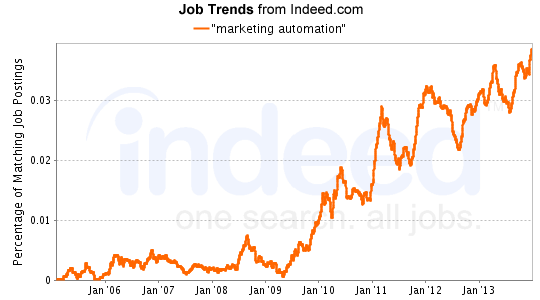 Not to mention the search trend for “marketing automation” job positions as you can see on the illustration below. We must face up to the consequences of lack of time, no question about that. I could list a bunch of case studies or scenarios when waste of time is present within an organisation. Probably one of the most obvious examples I can provide would be that of the proper management and distribution of customer base the organisation already has. Let me be more concise. Let’s suppose I’m the marketer and someone from the top level management asks me for a report regarding condition 1, condition 2, condition 3 and so on…. I hope you get my point. So, if I get sweat, my heart pulse goes to the skies, then its more than enough proof that the organisation lacks the technology, an automation process to extract actionable data and drive decisions as quickly as possible. Another more relevant example would be the lack of a professional newsletter or email marketing automation platform, which is probably one of the wisest investments a company could have. Wouldn’t it be great to be up-to-date with the performance metrics of all the campaigns you run and always have a visual view of all the marketing channels or touchpoints you have? As a business owner, one of the most important KPIs you’d probably follow would be the return on investment (ROI). If one of the campaigns or marketing channels proves to have negative ROI, you must be alerted in time so that all necessary measures can be taken early enough to defeat this situation and bring a turnaround for the better. As a consequence as long as marketing automation can deliver quick solutions to the problems and greatly contributes to better performance of the online business as a whole, you may rest assured that any CEO or business owner would not miss this outstanding opportunity. According to latest survey conducted by Venturebeat and Ian Cleary from Razor Social, 79 out of 83 companies who have adopted some sort of marketing automation software, have witnessed a positive impact on their return on investment. However, it is not quite clear if it was worth the effort, at least that’s what it comes down to when interviewees were asked about their investments. I think it worth reading the original post regarding the final result of this survey, but in my opinion, the roughly 35 companies out of 83 who were not sure about their investment, in their case I am more than confident they simply lacked the proper personnel in charge of maintaining and coordinating all aspects of a marketing automation software requires. To reformulate my words into a more digestible context, the simple fact of owning a brand new machine is worthless unless you possess the new skills and requirements that makes your new machine rumble. It looks like the survey is still live, so in case you have already implemented a marketing automation software, you are more than welcome to share your thoughts, opinions and experiences. What increase or decrease in revenue have you seen since implementing your marketing automation provider? Small, medium and large businesses alike must take seriously their subscribers status, be it a newsletter subscriber, a sales or marketing qualified lead or a frequent buyer. Here, segmentation comes in place, the process which makes us marketers have a more comprehensive understanding of our visitors leading us to build up buying personas. Customers are not alike, they have different characteristics and this is what drives us marketers to treat them accordingly. You might be confronting with a high unsubscribe rates not realising that all the 47 thousand customers or subscribers you have gathered throughout the years are receiving the same newsletter or promotional offer, without applying any criteria. You must take action against this, manual work will not solve your problem, you need auto-triggers, you need customised offers and even more. You are overwhelmed with all the tools, softwares within your marketing arsenal. You need more processing power to handle all the thirty seven opened applications you have. This is inefficient, time consuming, costly and far from being productive. You might be using a professional CRM system, an email marketing platform, spreadsheets, social media platforms and so on. Now, what you need is an integration of all of these into a single platform and here comes marketing automation, a solution which is supposed to relieve your pain and take all the weight off of your shoulders. Besides their integration capabilities with other softwares, marketing automation platforms are evolving so fast that most vendors can provide almost all the services you would expect as a marketer. Let’s agree, when it comes to marketing, guesswork is not an option any more and especially taken in account the tremendous customer data available today. What once was impossible and extremely hard to achieve, today we’re empowered with technologies which help us better comprehend our customers’ behaviours. Marketing automation should be able to provide you with all data you need, pinpoint the problem as well as assisting you in making wiser decisions without wasting your time with manual data mining just to find the answer for your question. The tool should be intelligent enough to alert you and, last but not least, assist you in taking the right action steps for improving your marketing efforts. Let’s assume that at the moment you as a leader are checking the performance of your marketing team by simply asking them to send you reports, presentations or have occasional meetings. You are not interested in opinions or words, what you are interested are the numbers or the North Star metric, that’s what makes or might not make you happy, depending on what you want to see and what you do see. This is what a professional marketing automation would provide you whenever you want and in an easily digestible format. This comes from HubSpot one of the top leaders in all that marketing automation has to offer, not just in any kind of automation, as you’ll see after watching the embedded video below. These would be some of my views and opinions on all that marketing automation has to offer. I’d like to hear from you some further comments or thoughts be it either from the side of those who have already implemented an automation system or those who are still skeptical or simply still find it difficult to make this major step. Now, I’m curious what are your thoughts, opinions about the implementation of a marketing automation solution within your organisation. In case you’d already taken this step, what were the consequences, be it positive or negative ones? Let us know below in the comment section if there is anything worth being mentioned.